Manchester United squeaked into the Europa League by the skin of their teeth after failing to put Celta Vigo away in the second leg of the semi-final at Old Trafford. Indeed, United came perilously close to being dumped out with the very last kick of the game, only for John Guidetti to fluff his lines with the goal gaping. Play then ebbed and flowed, United allowing Celta to enjoy long wodges of possession without creating an awful lot of note – the home side equally unable to make anything stick on the break. Same old, same old. Sure enough, United’s flimsy lead was partially chiselled away in the 85th minute, as Celta defender Facundo Roncaglia flicked a long ball into the box past Sergio Romero to set up a nervy finish. 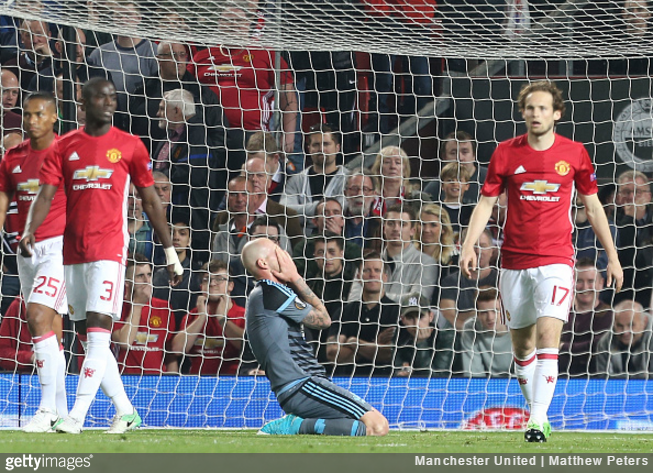 Celta now just needed a single goal to oust United and, with five minutes of normal time remaining, the tension was instantly ramped up as things finally – finally – began to get interesting. The rolling boil promptly came to a head just a few minutes later when a petty skirmish in the middle of the pitch resulted in a double sending-off – both the goalscorer Roncaglia and Eric Bailly seeing red for their respective parts in the squabble. With both teams freshly relieved of a player and injury time wicking away, Ander Herrera thought he’d scored the goal that would shore up United’s safe passage to Stockholm, only to see it ruled out for a Pogba foul in the build-up. In fairness, the chance was deceptively difficult (thanks to Antonio Valencia’s positioning and the speed at which the pass arrived), but definitely score-able – as can be gleaned from the haunted expression Guidetti was sporting for the rest of the evening. And so, United will now face Ajax (who held on to beat a resurgent Lyon in the other semi) in the grand finale in Sweden on 24th May. Another stagnant 1-0 win and their champions of all Europe, ish. It’s the Mourinho way. So “looking likely” was downgraded to “skin of their teeth.” What a shocker. We’re in the final. That’s good and you can’t knock that but this team, and Jose, need a serious kick up the arse next season. These players are too good to be scraping a draw, with 39% position at home, against Celta Vigo. The way Jose has got us playing just breeds nerves. We should be going out to win that game 3-0, not sitting back like we did and almost losing it at the end.